A closer look at the upper floors of Scarlet Moon Hall. Although not descried in the text, I chose to give the tower arrowslit windows because 1) it made logical sense 2) they can be seen in the illustration found in the book 3) it allowed me to use a mixture of wall tiles. I chose to alternate the arrow slits both vertically and horizontally for aesthetic reasons, as well as practical ones–I didn’t have enough arrow slit walls to make up every wall section of every floor. I chose to use shuttered windows for the floor on which Elizar’s chamber is located, affording him the ability to open the shutters and deliver sermons to his followers (a bit like Saruman from Orthanc). It also seemed reasonable that this floor may have once served as the chambers for a lord, commander, or other person of importance when the keep was originally built, and thus full windows would have been more useful. 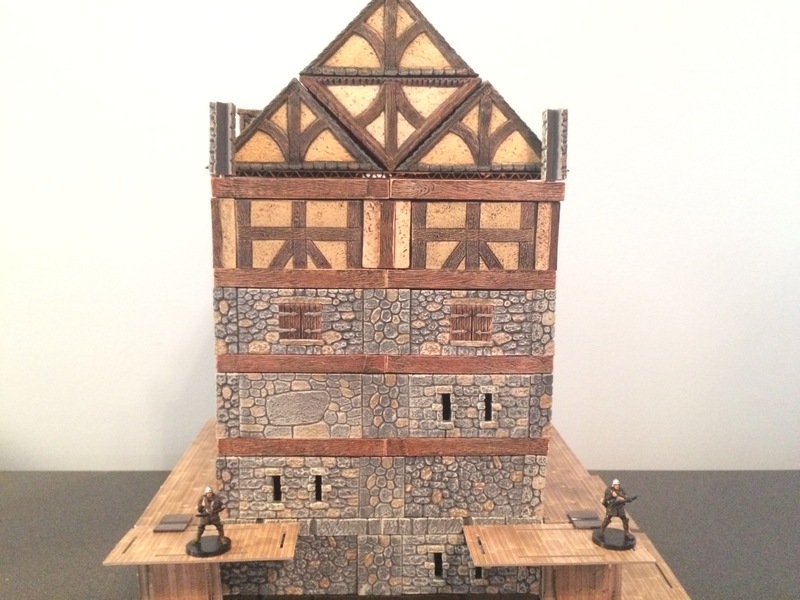 Above this floor I opted to use tudor walls instead of stone but for practical reasons (I had them around and was running out of stone walls) and for aesthetic purposes (it represents the start of the attic, which could very well have been constructed solely of wood). Above this floor I have arranged pieces to form an appropriately sized roof. The spirets seen in the map and illustration of Scarlet Moon Hall I have represented with stone corner posts.